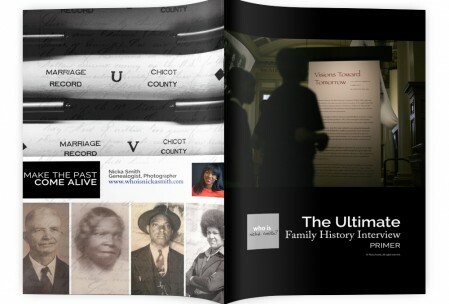 Win a Hardcopy of The Ultimate Family History Interview Primer! - who is nicka smith? Win a Hardcopy of The Ultimate Family History Interview Primer! I’ve got something new on the horizon, and I want you to have it! The Ultimate Family History Interview Primer! This combined list of questions was developed with the intent of conducting a video or audio taped interview on an individual who wants to leave a personal record behind. Additionally, an individual can use their responses to these questions as prompts to develop a manuscript for an autobiography. I developed this guide when I sat and interviewed my father in law about his life last summer. I knew there was no way I could keep it to myself since I knew it would benefit those in the genealogy community. Now, you can win a free hardcopy of this 12 page primer. Nearly 190 questions in total! You won’t need another thing to help you with interviewing your relatives PERIOD! I promise. Just about everything you can think of is covered in this guide. Sign up for my email list by 11:59pm CDT on June 1, 2015 (below or at this link). One winner will be chosen, at random, and announced on Tuesday, June 2, 2015 on this blog. The winner will be contacted by email to provide their mailing address to receive the guide by mail.